This story actually started back around the winter of 2003. 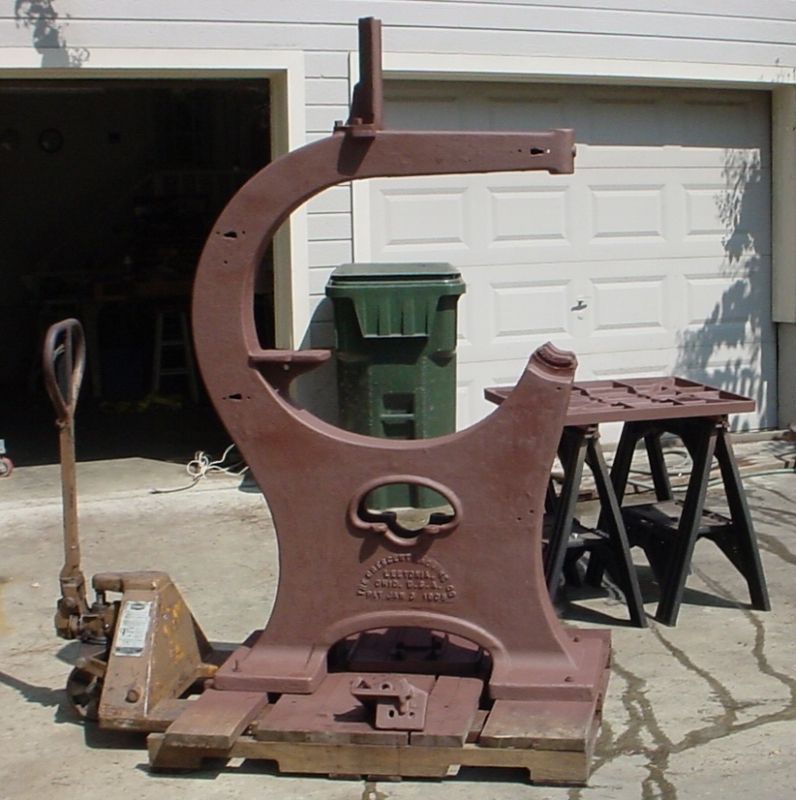 A long time acquaintance from the OWWM web site, Randy Wilson of Indianapolis, IN, contacted me about a band saw that he had recently acquired. 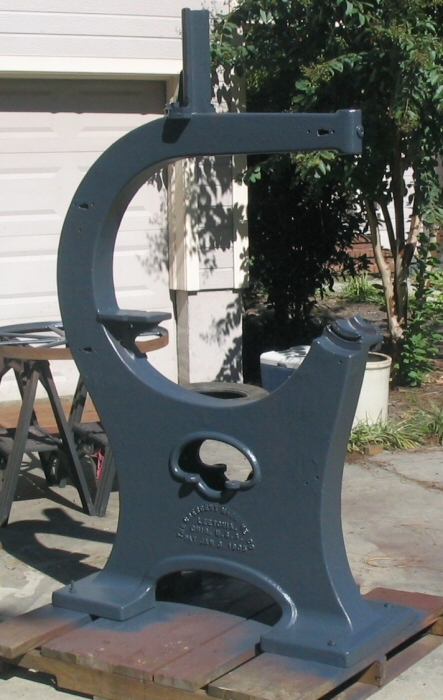 He had a lead on an old Cordesman & Egan band saw that was at an old factory that was being torn down. Knowing that this band saw was pre 1900, he wanted to rescue it and made arrangements to purchase it. While he was loading the band saw up, he spoke with someone at the property that told him that there was another old band saw there. Over, buried in a pile of weeds was the hulk of a band saw laying on it's side. A deal was made to buy the "other" band saw and he returned later to claim it. 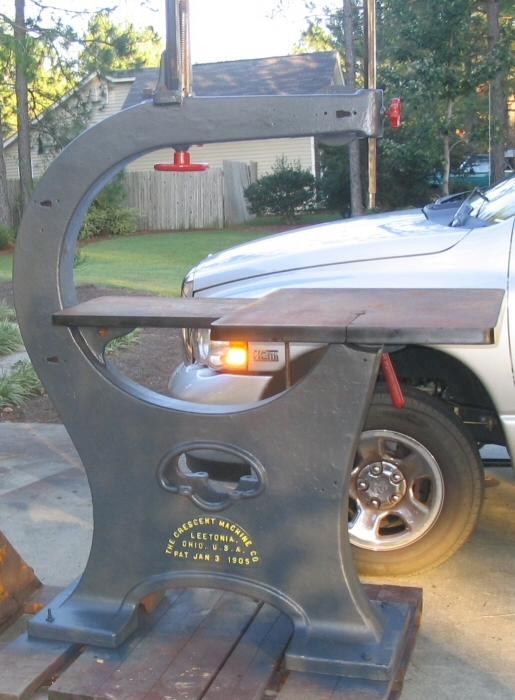 Upon setting it up and loading it in his truck, Randy discovered that the band saw was a Crescent 36" machine. Knowing my interest in Crescent, he sent me some photos telling about his prize. 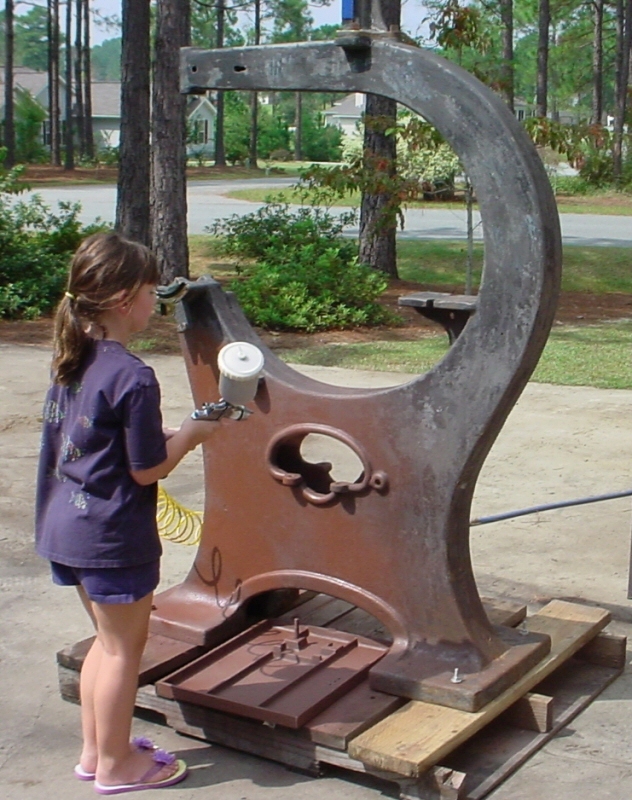 I of course, was very interested in the old Crescent band saw. While Randy had not really offered, I asked if the machine might be obtained. Now, at the time, I did not have a place to put this saw - it was way to big for my little garage shop, but I just had to ask. Randy replied that if I wanted it, he would consider selling it to me. Not having a place for the machine, I tucked the saw away in the back of my mind and time went on. Now, fast forward to the summer of 2004. 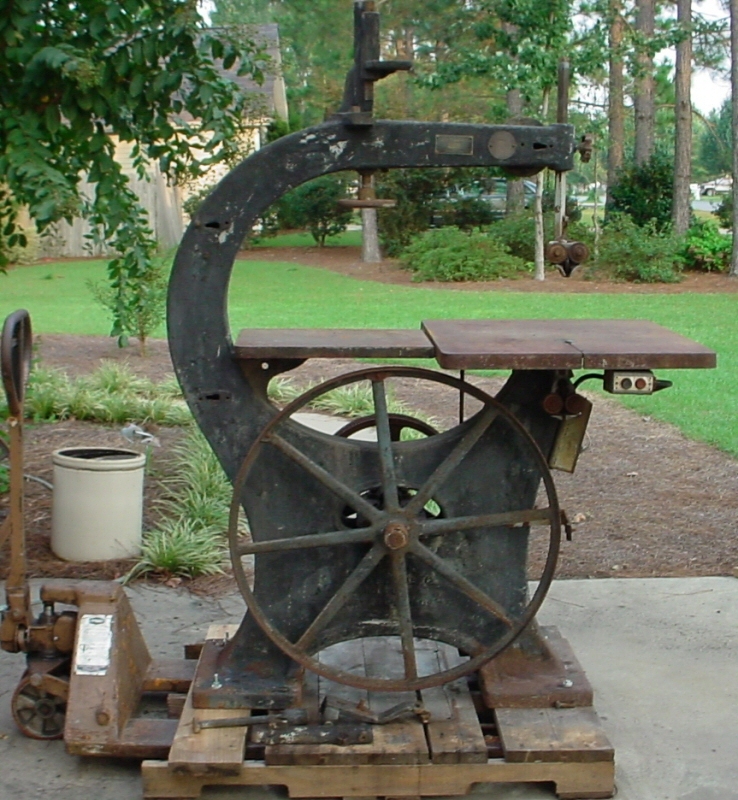 The curator of a local museum contacted me about an offer they had received for an old Alexander Dodd's Tilting Top table saw. The museum has a steam powered, line-shaft driven woodworking shop (called the Variety Works). I have been a long time cooperator on this shop, actually having written the Interpreters Handbook for the shop back in my college days and I still do quite a bit of volunteer work at the museum. When he showed me the pictures of the table saw, I immediately told him that this machine would be a great improvement over what was in the Variety works at the time - a Crescent Universal Woodworker. 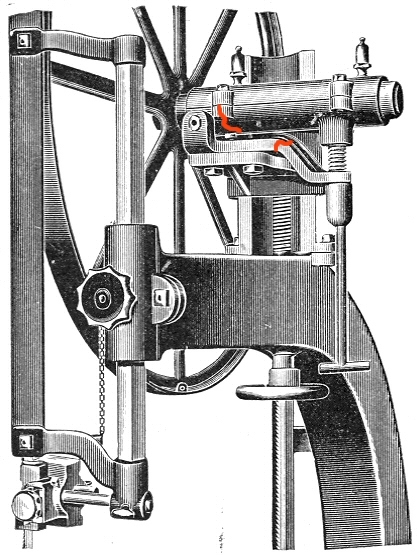 Now, the Universal Woodworker is a great Machine but the problem was that the machine was a later production machine and was designed to run from from below rather than from a line-shaft above. Bottom line, the Universal Woodworker was just a "historically inaccurate" machine for the shop that they had. Replacing it with the Dodd's saw would put the machines back to being period for the shop. The only problem with replacing the Universal Woodworker with the Dodd's saw was that it would mean that the display would be loosing a band saw and jointer - the other machines that were on the Universal Woodworker. I told them that I would be on the lookout for a Band Saw and Jointer and to go ahead and get the Dodd's table saw. 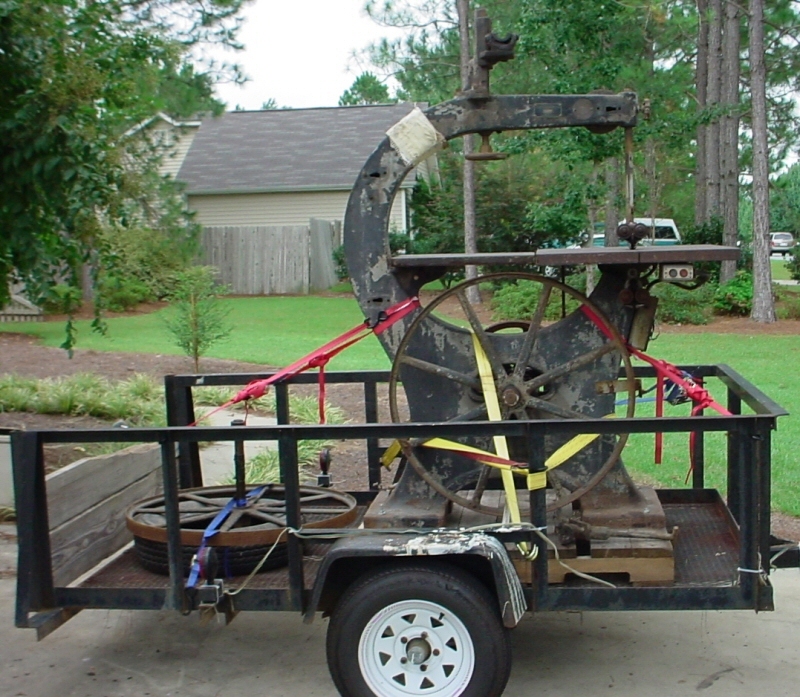 With this knowledge in mind, I recalled the 36" Crescent band saw that Randy had tucked away in his shop. I contacted Randy about the possibility of acquiring the band saw and in short time a deal was worked out. All that was needed was to make the 1500 mile round trip journey to Indianapolis to pick it up. A look at my calendar and a date was picked out a month or two down the line. Finally, the day arrived - September 24, 2004. I left Tifton, GA bright and early (5:30 am) on that Friday morning with a utility trailer in tow and began my 13 hour drive for the day. Actually, the first leg of the trip was to Terra Haute, IN to meet up with Brad Scott, who had several other items including a band saw blade sharpener, a band saw blade saw set and a circular saw set. Brad also had some parts for an old lathe including some cast iron legs and a few steady rest. All for the museum as well, I decided it was worth an extra hour or two on the road to pick them up. I arrived at Brad's place about 5:00 pm and had a nice visit with Brad and loaded up the old iron. I then headed out to Indianapolis to spend the night - arriving about 7:30 pm that night. The next morning, I again got up early and made about a 40 minuet drive over to Morristown, IN, just southeast of Indianapolis to meet up with Randy. Arriving about 7:00 am, Randy was outside waiting on me. 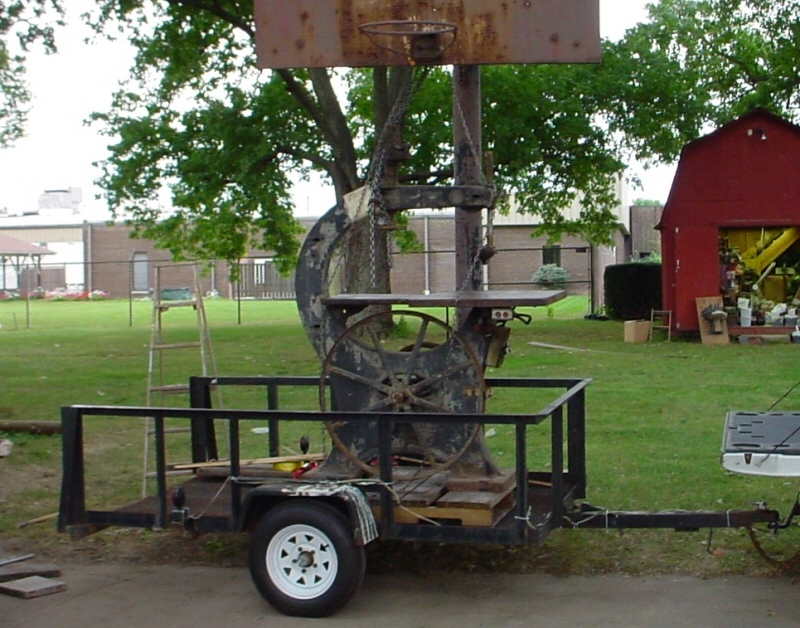 Randy had moved the band saw outside underneath a big "heavy duty" basket ball goal the night before. The first thing that hit me when I pulled up in his driveway was how big that band saw was. I had been around machines just like this many times before but knowing that I was about to load that big hunk of cast iron on a trailer and haul it 750 miles down the highway kind of scared me a little bit! After a short visit, I backed the trailer up to the machine and Randy hoisted it up using a chain hoist attached to that basket ball goal. Don't try this with your average basket ball goal - remember - I said this one was "heavy duty"! Once it was raised up just enough, I backed the trailer under the saw and it was lowered onto a pallet in the back of my trailer. Now, that was a crazy few minuets as that 1200 lb saw hung from the top of that goal! I sure wish that I could have had a picture of it hanging in the air there but lets just say that we were a little bit to busy at the time to be taking snapshots. I did get this one right after we lowered it onto the trailer though. After loading, I bolted the saw to the pallet and then strapped everything down to the trailer using lots of nylon ratchet style straps. I snuggled the saw down so tight that I felt for sure that it would not move on the trip home. Fortunately, I was right - it did not move a bit. That did not make me feel any better every time I hit a bump in the road on that 13 hour ride home though. I was worn out from worrying about the load on the trailer - especially as I road down some of the worst highways I think I have ever been on around Louisville! When I got to Atlanta, it was getting dark and I was about three hours from home. Knowing that I was *really* tired and not wanting to drive the rest of the way home in the dark, I decided to make a pit stop at my parents home near Atlanta. pulling into the drive way about 7:30 pm (right before dark), I spent some time visiting and got a good nights sleep. The next morning, I was once again up early and pulled out about 7:00 am. After a three hour trip home, I finally backed the trailer in the driveway about 10:00 on that Sunday morning. After pulling out of the drive way on Friday morning, I had driven 1570 miles - about 27 hours behind the wheel over a 52 hour period - all by myself. It was a good feeling to be back home. Unloading was actually pretty easy. The bed of entire trailer is designed to tilt at the axle when a lookdown is released at the front. I borrowed a pallet jack from my office and moved the saw back just enough to balance it over the axle and then released the trailer and slowly tilted the bed to the ground. I then jacked the pallet up with the pallet jack and rolled it off of the trailer nice and slowly. After some discussion on the OWWM forum, I decided that the best way to handle the broken parts was to braze them back together and then send them to Cattail foundry, a foundry in PA that is ran by Amish foundry men and have them cast new parts. More on this later. I was able to take a couple of hours off work on this afternoon and spent most of the time working on the saw. Most of the time was spent just taking everything apart and getting it ready to clean and paint. 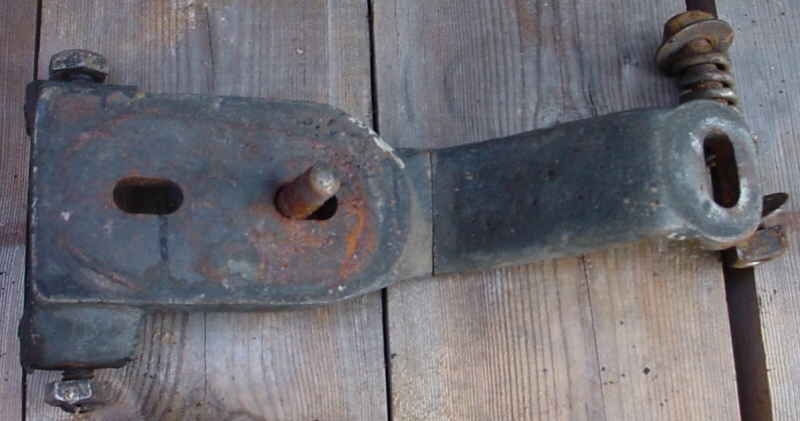 The biggest challenge was removing the big vee-belt pulley from the bottom wheel of the saw. I used a gear puller but part way through, it started to cross thread making it really hard to finish. It actually took me about an hour and a half to get the bottom pulley off! I finally got the job done though. I took the gear puller back to be replaced (it came with a lifetime guarantee) and then tried to use it on the bottom wheel of the saw. Unfortunately, the bottom wheel was on way too tight and the gear puller would not do the job - I would have to press the wheels off. By this time, it was getting dark so I abandoned the job until the next day. The job for today was getting the axle out of both the top and bottom wheels. I had a hydraulic press that I could use but the wheels were way to large to fit up on the table. Improvising, I took the top of the press apart and slipped the wheels on over the two uprights and then re-assembled the top of the press to do the job. While it added a little more work taking the press apart, it actually worked out just fine - just took a little while. Here is a pictures of me pressing the axle out of one of the wheels. The rest of the time I had this evening was spent using a wire wheel to clean the castings up from the saw and getting them ready to prime. I spent a few hours this morning further cleaning the saw up and getting it ready to prime. I also spent a couple of hours picking up trash and debris from the yard from the tropical storm that passed over on Monday! Fortunately, most of the *loose* stuff had been knocked out of the trees three weeks earlier when TS Francis passed over! Around lunch time, it was time to paint. Using my HVLP sprayer, I sprayed on a nice coat of red primer. My 7 year old daughter had told me the day before that she wanted to help daddy paint the saw so when the time came, she came out and actually sprayed on most of it for me. Here is a picture of Hannah priming. I finished up working on the saw about 2:30 today, just in time to go in and take a shower and watch the Georgia vs. LSU game. This was the most fun part of the day - the Dawgs blew LSU out of the water. Nice revenge after they beat us twice last year (once in the regular season and once for the SEC championship). Go Dawgs!!! Next on the agenda is to get the bearings brazed up and sent off to Cattail foundry. It has been a busy few days. Unfortunately, this has meant that the band saw restoration has not been on the list of things to do. I finally got a chance today to get the couple of broken parts brazed up. I made a trip to the local welding supply house and bought a handful of brazing rods - cost about $3.50. Then I made a trip to a local farmers shop that would let me borrow his torch for this job. Now, I first may tell you that I was a wee bit worried about doing this brazing job. The last time I brazed anything was back in my sophomore year of high school when I took a metals technology class. That was in 1982. I did a little reading to before hand to refresh my memory and just got in there and started brazing. It did not take long and it was all coming back to me. In the end, I got the three parts brazed back together and I thought that the brazing job was pretty good - epically since it has been 22 years since the last time! Picture below. Not much time today to do anything but I did want to get the parts ready to send out to the foundry for re-casting. Because my goal here was to stick the parts back together well enough to be used as patterns rather than holding up for use, I decided to grind the brazed joints down as close to the original shapes as possible. I used a pneumatic die grinder and a carbide rotary file and ground the beads down flush with the metal. On the case of the short bearing cap (the one of the left in the pictures), I wanted to make sure that the area where the weld is had a nice fillet so that it would be strong in the resulting casting. 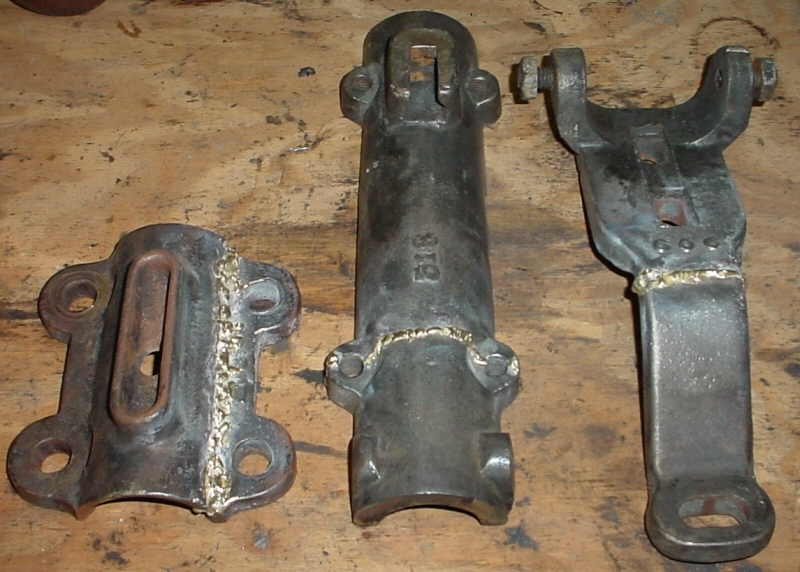 The grinding went pretty fast and the brass cut off much faster than the cast iron so it was easy to remove the brazed portion without removing much cast iron. I do plan to use some epoxy filler to fill in a few small voids that did not get brazed up well. My wife is out of town all weekend so I will be playing Mr. Mom and will not have much time to work on the saw. I do hope to have the parts ready to ship out to the foundry on Monday morning. 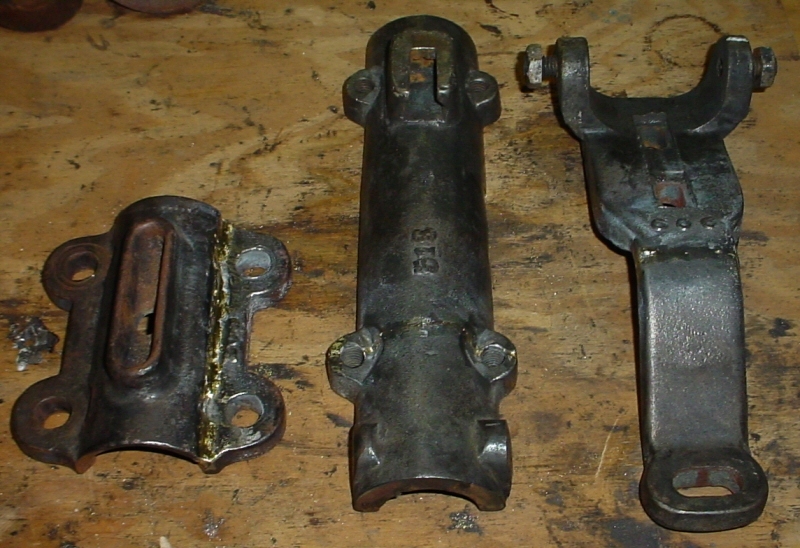 Here are the parts after grinding. Had enough time today to do just a little bit more. I took some epoxy and filled in some of the rough spots on the castings. The parts, while not the prettiest in the world, should work just fine for patterns now. I boxed everything up and got it ready for UPS to pick on Tuesday (Monday is a holiday - Columbus day - and UPS will not be running). I have a busy week at work this coming week including several days out of town. Probably won't have any time to do anything until next weekend. Spent some time today cleaning up some of the smaller parts on the saw and getting them primed and ready to paint. 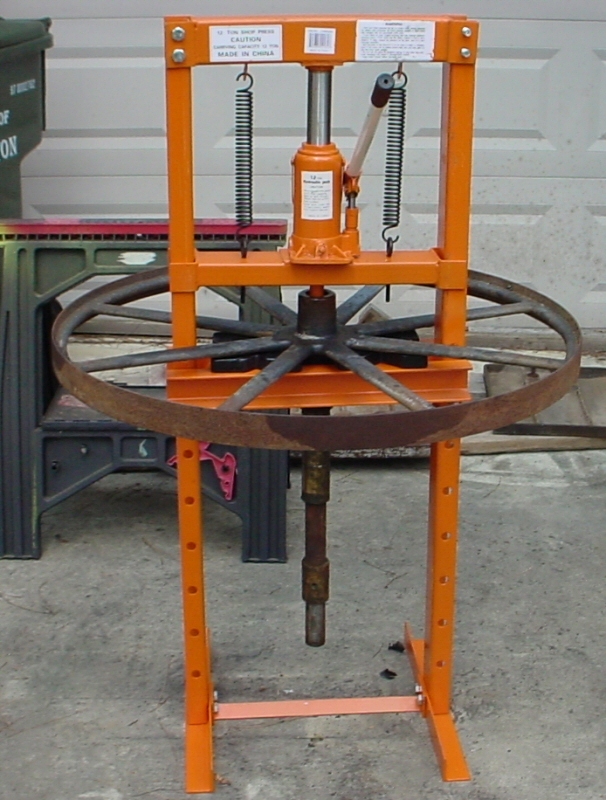 This includes the two band saw wheels. Unfortunately, I also had a lot of yard work to do so I did not have as much time to work on the saw as I had hoped for. At the end of the day, everything was ready to paint though. I had originally decided to wait until I had the bearings poured before painting anything but after thinking things over, I have changed my mind. I think I will go ahead and paint everything tomorrow except for the bearing pieces (which are at the foundry for the most part anyway). I will have to do some touch up painting after I get it all back together so I can just paint the bearing pieces then. After Church today, I stopped by Lowe's and picked up some paint. I usually paint with Rustolium Enamel and I decided that for this project I would do the same. The only problem is that I want to paint this machine as close to original as possible. When I took the machine apart, I found a few pieces that still had the original paint on them - things like the back side of parts that had been bolted together. The original paint was somewhat faded and very dull but it was possible for me to get a close idea as to what the original color looked like. It is hard to describe in but lets just call it a dark gray - almost black but definitely gray. I considered taking a part to a paint store and having them computer match it but because the part was so dull, I was worried as to how well it would work. So, instead, I just decided to do some mixing and get as close as a match as I could get with my eye. So, I picked up a pint of Rustolium Satin Black and an 8 oz. can of Gloss White. Back in the shop, I poured the Satin Black paint into a empty paint can and then started mixing the white in to make a gray. I did not know how much I would need so I just poured a little bit in at a time until things started looking right. In the end, I used the entire 8 oz. of white in the pint of black and got a match that looked pretty good. At first, I thought it was a little too dark but as I let a sample dry and hold it up to the original paint, darn if it was not a near perfect match! Of course, my mixture was a bit glossier than the faded original but the color was right. Next, it was time to start painting. I took all of the small parts and laid them out on the driveway on a piece of cardboard and took one of the wheels and put it on some saw horses. Next, I pulled the band saw out in the driveway using a pallet jack and we were just about ready. I took my mixture and poured it into my HVLP sprayer and started painting. The wheel first (since I had to swap it with the other wheel), and then the loose parts and then over the main casting. In short order, I had everything painted. After the paint had dried for a few hours, I did some touch up painting. I decided to paint the edges of the tables on the saw black to give it some contrast and paint all of the handles red. I also took some yellow paint and painted the raised letters on the base of the saw so they would stand out. Next, I started putting some of the parts back together. After all of that, I the sun was getting low in the western sky so I decided to call it a day. Before heading in for a shower and dinner, I took a picture of the days work. The sun was low enough that it was hard to take a good picture - I had to move the saw in some shade so that it would not be too bright. Not the best picture but you can at least see how things are going. Pretty good for a days work! I have about done all that I can do before I get the castings back from Cattail Foundry. Some things still left on my check list include cleaning up the rust on the two tables (a wire brush should do the trick) and a little lathe work on the two shafts for the upper and lower wheel bearings. I decided to and make new shafts rather than use the old ones as they were somewhat worn. Also, the lower shaft had been cut off short when they took the two flat belt pulleys off and replaced them with the vee-belt pulley. Other than that, not much left to do until I get the castings back and can pour the babbitt bearings.